True Video iPod on the Menu for Apple Event? Zomg! 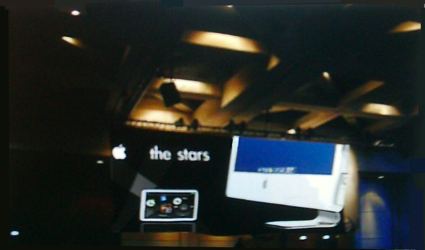 Tuaw has what appears to be a camerphone shot of a banner featuring some kind of fullscreen video iPod. The shot was supposedly taken by am employee at the Yerba Buena Cener for the Arts in San Francisco—the same theatre that will be hosting the "Showtime" event from Apple tomorrow. We've been speculating about the touchscreen video iPod for months—is it finally here? Honestly I was only expecting nano upgrades, and the true video iPod wasn't going to come until MacWorld in January, but I'll take this. Unfortunately, it could be a fake.